Black Friday 2015 has come and gone. Let’s take a look at what the various news agencies and data collection companies have to say about how well the retailers managed this season. 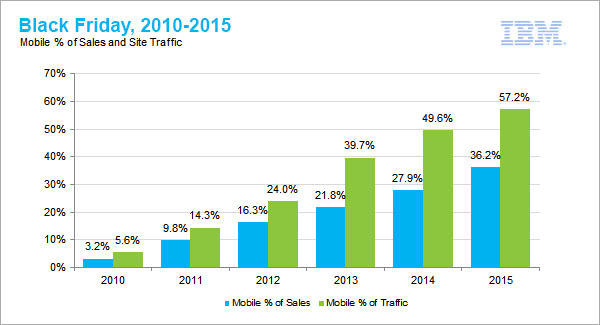 Black Friday Sales Results 2015 (IBM): According to IBM, online retail sales grew in double digits on Thanksgiving Day and Black Friday while mobile traffic exceeded that of desktop. Visit the IBM website to read the full report to see the latest shopping trends. 77 percent of shoppers had started their holiday shopping as of November 28. 42 percent of consumers said they shopped in stores over the Thanksgiving weekend, the exact same amount as those who shopped online from Thursday through Sunday. 151 million unique shoppers were in stores and online over the weekend — more than the 136 million who said in the early November National Retail Federation survey that they planned to shop. 73 percent of shoppers — 75 million people — were in stores on Black Friday, the exact same percent for the amount who shopped online on Black Friday, resulting in the biggest shopping day of the weekend. 41 million of those who shopped over the weekend said they shopped online on Thanksgiving Day (40%). Half of those who shopped in stores on Thanksgiving Day were at stores by midnight. The average Thanksgiving Weekend shopper spent $300 between Thursday and Sunday, and more than three-quarters (77%) of that amount was spent on gifts; leaving about one-quarter for self-gifting and other non-gift items. One-third of weekend shoppers said 100 percent of what they bought was on sale. Half of those who shopped over the weekend said they shop because the deals are too good to pass up and one-third said they shop because it’s a tradition. You may also want to read the Thanksgiving Weekend Sales Survey from the NRF. Saturday November 28, 2015 Reuters: The Reuters article reported that sales at U.S. brick-and-mortar stores on Thanksgiving Day and Black Friday were down slightly from last year, but the performance was still seen as strong in a holiday shopping season where discounts spread well beyond the weekend and many shoppers moved to the web. Online sales were up by double digits, according to data released on Saturday. Data from analytics firm RetailNext showed overall sales for both days fell 1.5 percent on flat customer traffic, while average spending per shopper dropped 1.4 percent. Preliminary data from ShopperTrak showed sales at stores totaled about $12.1 billion on Thursday and Friday. The company said it is an "estimated decrease from last year" but did not give the percentage decline due to an internal change in the way it calculates data. Last year, it reported sales of $12.29 billion for the same period. The article went on to mention, Online Thanksgiving and Black Friday sales tracked by Adobe Digital Index were $4.47 billion, up 18 percent from a year earlier and higher than its expectation of $4.35 billion. Adobe tracked 80 percent of all online transactions from the top 100 U.S. retailers. Brick-and-mortar retailers who have online operations offered better web deals during Thanksgiving and Black Friday and saw higher sales than online only retailers, said Tamara Gaffney, principal research analyst at Adobe Digital Index. The following graph from IBM is very helpful.